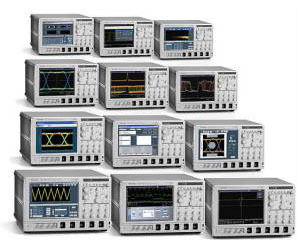 The DPO70000 and the DSA70000 Series are the new generation of real-time digital phosphor oscilloscopes and are the industry’s best solution to the challenging signal integrity issues faced by designers verifying, characterizing, debugging and testing sophisticated electronic designs. The specialized DSA70000 Series provides a complete and dedicated solution to address the challenges of high speed serial designs. The family features exceptional performance in signal acquisition and analysis, operational simplicity and unmatched debugging tools to accelerate your day-to-day tasks. The largest screen in the industry and the intuitive user interface provide easy access to the maximum amount of information.